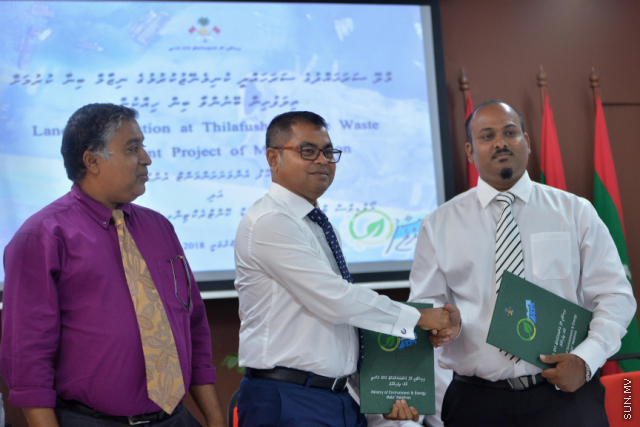 Maldives Transport and Contract Company (MTCC) has been contacted to reclaim land in Thilafushi for the new waste management system. The project was contracted to MTCC for MVR 105.5 million. At a special ceremony held at the Environment Ministry today, the agreement was signed by the Environment Minister, Thoriq Ibrahim and the Deputy Managing Director of MTCC, Ahmed Kurik Riza. Speaking at the ceremony today, Minister Thoriq said that the project is contracted to reclaim 15 hectares of land in 240 days. Minister Thoriq said that burning waste as a means of disposal affects the public negatively. So the government's aim is to install a safe waste disposal system. Thoriq said that the government is working to acquire funds from the Asian Development Bank for the infrastructure as the land reclamation is completed. Minister Thoriq said that an incinerator and a land fill system will be acquired when the the ABD aid is received along with a system to create electricity from the heat of the incinerator. The Environment Minister said that the designs for the resources have been completed.